← A few weekend photos. Easter: New life for nature, new life for me. It’s a simple way of telling them the good news, the MOST IMPORTANT news I could ever tell them. They have a Savior Jesus who loves them, died for them, and will one day welcome them into heaven as one of His own. This past week, when a small child from our church died suddenly and unexpectedly, I was reminded of how very important it is to constantly be in conversations of this nature with our children. They simply must know Jesus. We do not know the day or the hour in which we will die. We just know that we will. Our children need to know their God and Savior just as we need that as well. Around here, we are pretty excited for Easter, this coming Sunday. Because of Easter, because Jesus rose from the dead and conquered death once and for all, we can all have life. 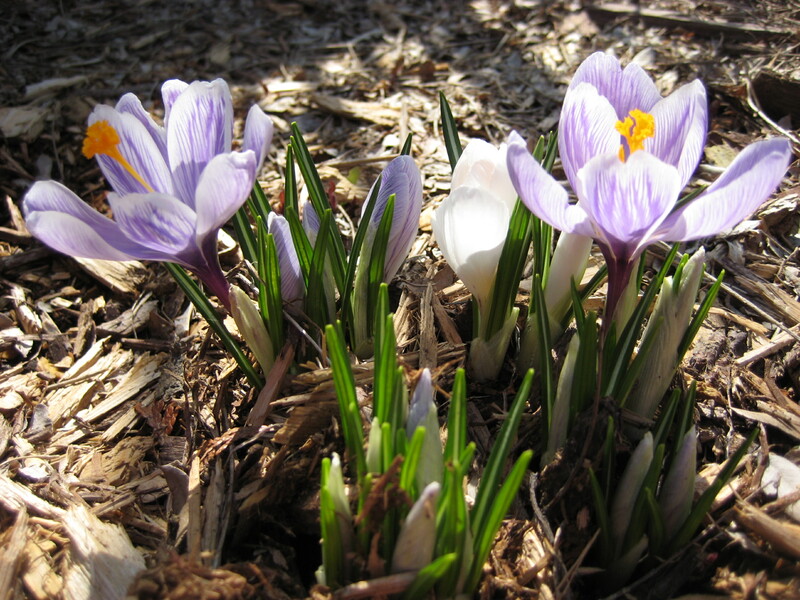 Crocuses, part of Gods glorious creation. We don’t need to look any further than the natural environment God created for us to see Him. The earth is shouting out the good news for us! A God who would create such a wonder would surely care enough to see things through. And has he! Yes, we have sin and death now, but what we really have is a Savior from these things… God’s own son. He’s already carried out the plan to take sin to the grave and leave it there, then rising again with New Life for all who believe in Him. We rise with him! Alleluia! When I work the earth this week–planting and amending–I’m going to dwell on these thoughts. And share them with my children. It’s so very important. This entry was posted in Children, Inspiration and tagged christian gardening, crocuses, Easter, Jesus, new life, talking to kids about God. Bookmark the permalink. Are you planting and amending in the snow like me!! I can’t believe the snow, I did a double take when I saw it. I think I’ll just have a coffee and wait for the snow to melt. It can’t be here long, right? What a beautiful writing that simply flowed from your heart. Thank you for sharing these words of faith for others to appreciate.